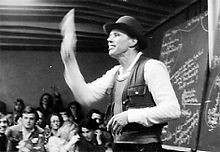 Performance artist Joseph Beuys in 1978: Jeder Mensch ein Künstler — Auf dem Weg zur Freiheitsgestalt des sozialen Organismus - Every person an artist — On the way to the libertarian form of the social organism. Joseph Beuys in: Joseph Beuys, Carin Kuoni. Joseph Beuys in America: Energy Plan for the Western Man. New York, 1993, p. 128; Comment on his first Fluxus performance in 1963 'Heal like with like'. If a performance artist started going on about England and our culture like that-in fact that's happened to Gilbert and George, they are about the only ones I know that have done anything of this sort. It seems to me that both yourself and other artists can talk about flags and America and all this… you can play with these ideas, you may not believe in it, that you can play such a close game with them without anyone being offended. Never worry assess discuss or criticize but remain quiet, respectful and calm. Tami Peterson has always been hyper-critical of my performance art. I mean she even delivered a speech in the quad about it called "Imogene: What do You Mean?" I mean, how could she do that to me? I've always been so nice to her! T he psychedelic community has not yet recognized or named itself as a community. We are well behind gays and black people and all those other mi-...we are still trying to figure out if we are a community. And if we are a community, and we have a domain of action, I think where it lies - it's not that we are all supposed to become dope dealers, it's that we are all supposed to become artists; that the transformation of culture through art is the proper understanding of what you can do with psychedelics besides blow your own mind. And I really think, you know, what we need to do is put the art-pedal to the floor, and understand that this is art - we are involved in some kind of enormous piece of performance art called Western civilization and, you know, it's been a C-minus performance so far... And they are just about to reach out with the hook and drag us offstage, unless we begin pulling rabbits out of the hat pretty furiously. James Franco has turned much of his adult life into performance art that feels equal parts sincere and con game, and it would seem he'd be well cast as Oscar Diggs, a small-time illusionist and unabashed serial liar working the dusty back roads of Kansas in 1905. The problem is, Franco's a lot more believable playing slimy than sincere, and the part requires him to do both. It's a steady but less-than-captivating performance. … Much of Oz the Great and Powerful centers on Oscar's transformation from me-first slickster to the Wizard of Oz, aka Man Behind the Curtain. With Oscar relying heavily on the inventions of Thomas Edison, his hero back on Earth, to pull off his biggest trick ever, Oz the Great and Powerful finally breaks free of its beautiful but artificial trappings and becomes a story with heart in the final act. Thing is, we know Oz and its wizard and those witches and the Munchkins are destined for a far greater adventure a little ways down the Yellow Brick Road. The landscape won't be as amazingly gorgeous and the witches won't be able to fly about and hurl fireballs with the ferocity they display here, but it will be a much more magical adventure all the same. Roptell and Morgan Dehar. The act is an ode to the modern artists “Gilbert & George”. There is a definite prejudice towards men who use femininity as part of their palate; their emotional palate, their physical palate. Is that changing? It’s changing in ways that don’t advance the cause of femininity. I’m not talking frilly-laced pink things or Hello Kitty stuff. I’m talking about goddess energy, intuition and feelings. That is still under attack, and it has gotten worse. RuPaul, in RuPaul speaks about society and the state of drag as performance art, Wikinews, 6 October 2007. Performance Art is a loosely defined area of artistic exploration, i.e, the artistic counterpart of a scientific research program. It encompasses a wide range of activity involving an ever-widening variety of artists with diverse styles, methods, and concerns. Had we set ourselves the task of characterizing the ambitions of performance artists, we should have had to abandon hope of saying something instructive about the import and intention of this nontraditional school. Generalizations are suspect at this stage. Performance art isn’t hit/miss. It’s miss/miss/miss/miss/hit/miss/miss. It’s really life and death [not art].When they tell you your mother is 80 years old but you cannot see her again, you can never call it performance art. Or when your son is three, and they tell you that when you are released he will be in his teens and can never recognize you as a father. You feel terrible inside, to lose those chances. Each day, they tell you, 'You will spend your life day after day the same, minute after minute the same. You just have to pay [with] your life for this kind of so-called freedom that you are fighting for.' There is no sense of justice there. Why do I have to do this with them? Why do I have to argue or play this game?"